This all music converter has more advanced features, that can easily merge several audio files into a single one, trimming any clips of audio. 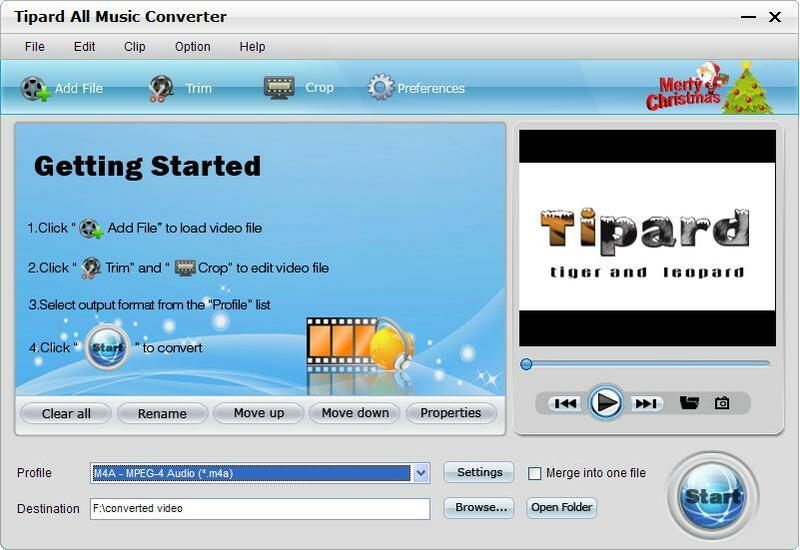 Tipard All Music Converter also possesses intuitive and friendly interface as well as fastest conversion speed for you to get the perfect hearing. As powerful music converter software, it can convert music formats between almost all music formats MP3, MP2, AAC, AC3, WAV, MID, MIDI, WMA, M4A, RA, RAM, OGG. The all music converter program also supports extracting music from video files and convert to MP3, MP2, AAC, AC3, WAV, MID, MIDI, WMA, M4A, RA, RAM, OGG. The all music converter can trim your wanted audio episode exactly by set the start and end time or drag the slide bar. Qweas is providing links to Tipard All Music Converter 4.2.12 as a courtesy, and makes no representations regarding Tipard All Music Converter or any other applications or any information related thereto. Any questions, complaints or claims regarding this application Tipard All Music Converter 4.2.12 must be directed to the appropriate software vendor. You may click the publisher link of Tipard All Music Converter on the top of this page to get more details about the vendor.